St. Petersburg hotels are renowned for their world class comfort and amenities, providing guests with top of the line service that leaves them wanting for nothing. Whether in town for business or for pleasure, these hotels make their guests feel like they are home, providing them with opportunities to relax and work as they please, without having to worry about their personal needs or concerns. Full kitchens free Wi-Fi and a location convenient to the airport get a thumbs up from our guests at Extended Stay America - St. Petersburg - Clearwater - Executive. This pet-friendly hotel has three floors and 104 rooms. Guests can do it themselves in a full kitchen with stovetop microwave refrigerator cookware and tableware. You can sit at a spacious work desk and update your Facebook friends with free Wi-Fi. Local calls are also free. The hotel features a guest laundry and parking (for an additional fee). Extended Stay America is two miles from St. Petersburg-Clearwater International Airport and 13 miles from Tampa International Airport. You can watch the pros swing for the fences at Tropicana Field home of the Tampa Bay Devil Rays baseball team an 18-minute drive. Dip your toes in the warm waters of the Gulf of Mexico at Clearwater Beach 25 minutes away. Ruth Eckerd Hall the home of the Florida Orchestra is about 15 minutes away. The "excellent location" and "beautiful rooms" with kitchenettes get a nod of approval from our guests at Extended Stay America - St. Petersburg - Clearwater - Executive. Free Wi-Fi a heated outdoor pool and complimentary breakfast are welcome amenities for our guests staying at the Red Roof Inn Ellenton. The two-story Red Roof Inn Ellenton has 63 rooms some of which are designated non-smoking. Pet-friendly accommodations are available for a fee. Each room offers complimentary Wi-Fi a cable TV with premium channels a desk a seating area a hairdryer a mini-fridge and a coffeemaker. Wake up to a free continental breakfast and swim in the heated outdoor pool or soak in the hot tub. There are on-site laundry facilities and vending machines for added convenience. Parking is free. The Red Roof Inn Ellenton is one mile from Gamble Plantation Historic State Park. Three restaurants are adjacent to the hotel. The South Florida Museum is six miles away. Sarasota Bradenton International Airport is 14 miles from the hotel. our guests praise the "private" ambiance "great service" and "good size" rooms at the Red Roof Inn Ellenton. Boasting a Boca Ciega Bay marina an outdoor pool and a rooftop sun deck Treasure Bay Resort & Marina hooks up our guests with free Wi-Fi and in-room kitchenettes. The three-story Treasure Bay Resort & Marina is surrounded by tropical landscaping and sits on a marina and all 84 non-smoking rooms accessed by exterior corridors have dark wood accents free Wi-Fi private balconies or patios spa bath amenities flat-panel TVs and kitchenettes with granite countertops microwaves coffeemakers and mini-fridges. Rooms also offer bay or gulf views. Glide into the outdoor pool or hot tub or lounge on the rooftop sundeck. Work up a sweat in the fitness center and stay connected in the business center. There is also a guest laundry facilities and free parking. This Treasure Island hotel is one mile from The Club at Treasure Island and eight miles from Tropicana Field and the Florida Holocaust Museum. The Salvador Dali Museum and Clearwater Marine Aquarium are within a 35-minute drive. St. Petersburg Clearwater International Airport is 16 miles away. our guests enjoy Treasure Bay Resort & Marina's bay and gulf views as well as its private balconies and patios outdoor pool and hot tub. Just 3 minutes' walk from the beach this all-suite condominium-style Clearwater hotel offers a heated outdoor pool with surrounding sun terrace. Fishing at Pier 60 is 11 minutes' walk from the Pelican Pointe Hotel.A microwave refrigerator and dining area are featured in each accommodation. The private bathroom is equipped with towels and free toiletries.Laundry facilities are available on site for guests' convenience. In the surroundings guests can explore parasailing boating and jet ski hires as well as shopping.Clearwater Marine Aquarium is 2.6 km from Pelican Pointe and Clearwater Beach Marina is 1 km away. Sand Key Park is 3 minutes' drive away from the hotel. Guests enjoy free breakfast and scenic views of the ocean which is across the street at the Seaside Inn & Suites Clearwater. The Seaside Inn has 54 rooms on four floors some of which are designated non-smoking. Guests enjoy a free continental breakfast each morning and can spend the day by the hotel's outdoor pool. Parking is available for an extra charge. 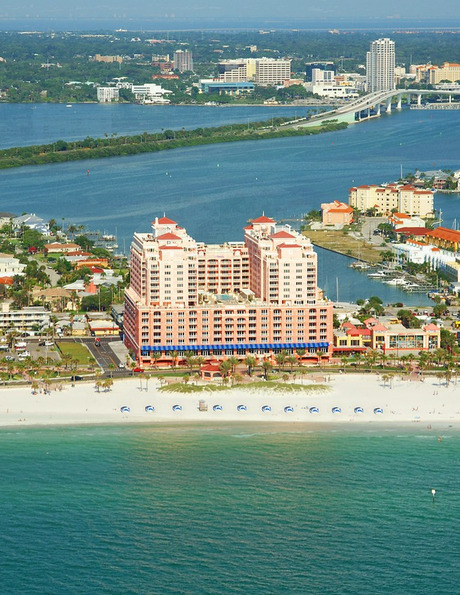 Clearwater Beach is directly across the street from the Seaside Inn and the hotel is a 10-minute walk from Pier 60 known for its restaurants and shops. The Seminole Hard Rock Casino is 30 miles away the Dali Museum is 15 miles and Busch Gardens is 39 miles away. Tampa International Airport is 21 miles from the hotel. our guests like the Seaside Inn's location "close to a lot of good restaurants the beach and shopping" as well as its "nice pool area" and a "friendly staff." A top-notch fitness room and sweeping views impress our guests at the Westshore Grand which also offers a location close to plenty of shopping and dining. The 11-story Westshore Grand gives a great first impression in a handsome glass building surrounded by palm trees. The fitness room with its cardio and strength-training equipment has lovely views of the city. All 323 rooms have a fresh feel done up in relaxing shades of aquamarine. Elegant bathrooms with lavish health and beauty products continue the color scheme. Look for ultra-modern amenities like flat-panel TVs with instant-access movies high-speed internet access and docks for your electronic devices. The beds are covered with luxe linens and plush robes are at the ready for when you want to relax. There's an upscale restaurant a lounge and a coffee shop in the hotel and room service is available any time of the day or night. Self-parking is free and valet parking is available for an extra fee. The hotel is in the city's business district next to several shopping and dining options. It's four miles from the University of Tampa and five miles from the Tampa Convention Center. The Florida Aquarium a favorite with youngsters is six miles east. If you have a flight to catch you're in luck: Tampa International Airport is three miles north. The upscale accommodations at the Westshore Grand are "beautifully decorated" and "very romantic" say our guests who also like the "great location" "convenient to restaurants and shopping." Amenities include free Wi-Fi complimentary airport transit a hot tub and year-round pool at the non-smoking Red Roof Inn Clearwater Airport. The three-story Red Roof Inn Clearwater Airport's 120 rooms come furnished with cable TV mini-fridges and coffeemakers. Guests keep fit in the exercise room and enjoy swims year-round in the heated outdoor pool. There's also a hot tub. The business center and free Wi-Fi add corporate convenience. Lunch and dinner are served in the restaurant and drinks are poured in the bar. A self-service laundromat ice machines and vending machines are also available. Parking is free as is airport shuttle service. The Red Roof Inn is two miles west of I-275 less than one mile south of St. Petersburg-Clearwater International Airport and 13 miles east of Clearwater Beach. It's 14 miles from Tampa's Raymond James Stadium. Family fun tops the list 24 miles away at Busch Gardens. Guests at the Red Roof Inn Clearwater Airport where Wi-Fi and parking are free praise the location that's "very convenient to the airport" and I-275. With free continental breakfast and a location within a 10-minute drive of the ballpark Quality Inn & Suites At Tropicana Field strikes a home run for central St. Pete convenience. The three-floor exterior-corridor lodging has 75 rooms facing the impressive outdoor pool. Rooms have high-speed internet access mini-fridges and microwaves. Free continental breakfast is served daily. Along with the heated pool there's a large sun deck and a hot tub. The hotel also has a gym and a laundry facility. On-site parking is free. 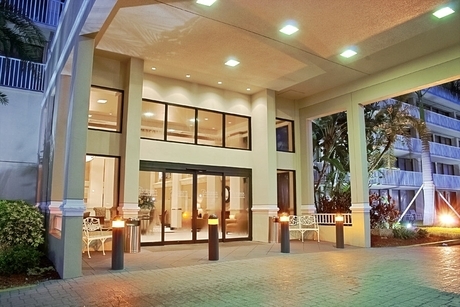 The hotel is a 10-minute drive from Tropicana Field home of the Tampa Bay Rays. The best of downtown from the world-renowned Dali Museum Museum of Fine Arts and Florida Holocaust Museum to the University of South Florida St. Pete campus St. Pete Pier/marina area and a rich restaurant scene is an easy 10-minute trip too. Highly accessible to I-275 your fast track to Tampa northbound and Bradenton southbound the hotel is a 15-minute trip from the Gulf coast beaches. It's eight miles to St. Petersburg-Clearwater International Airport and 19 miles to Tampa International Airport. When it comes to getting around St. Pete being so central sure has its advantages as do the freebies comforts and affordable rates at Quality Inn & Suites At Tropicana Field. Evening cocktails and Wi-Fi add to the welcome at The Inn On Third located in the heart of downtown St. Petersburg. The historic two-story Inn On Third offers 22 individually decorated rooms many with antiques and some with vintage touches like restored black and white tile in the bathrooms. All have cable TVs mini-fridges free local calls Wi-Fi access and hairdryers. The old-style sitting room is where guests convene for a complimentary evening reception that includes beer wine and snacks. There's also a tranquil fountain courtyard that's the perfect place to unwind or regroup. The Inn On Third's convenient downtown St. Petersburg setting is three blocks off I-275 and across from the Downtown Looper trolley stop. In less than a 10-minute walk east guests reach the BayWalk as well as the Museum of History and the Museum of Fine Arts. It's a mile to Sunken Gardens the Mahaffey Theater and the Salvador Dali Museum. Tampa Bay Rays fans are within a 10-minute drive of Tropicana Field. Flights can be reached 12 miles north at St. Pete - Clearwater International Airport or 20 miles away at Tampa International Airport. our guests love the homey feel of the Inn On Third located within walking distance of famed museums. Appreciating free Wi-Fi our guests go gaga over the waterfront views and beachy setting at the non-smoking Bay Harbor Hotel. The six-story Bay Harbor Hotel offers 252 rooms with private balconies some with bay or sunset views and all with free Wi-Fi cable TVs mini-fridges and coffeemakers. The hotel has a gym and a business center overlooking the bay. There is also a private dock with a thatched roof and jet-ski rentals. The hotel is home to one of Tampa's landmark indoor/outdoor seafood restaurants Hogan's Beach serving breakfast lunch and dinner. On the hotel's little stretch of sand guests can play volleyball or just kick back. Less than four miles from Tampa International Airport the Bay Harbor Hotel is located at the entrance to the Courtney Campbell Causeway — the scenic way to get over the bay and into Clearwater in 15 minutes. Within six miles of the hotel guests will find the International Plaza and Westshore Plaza. Ybor City and Florida Aquarium are 10 miles away and the Lowry Park Zoo is 15 miles. our guests rave about the "great" view of the bay the "perfect size of the rooms" and the "friendly staff" at the Bay Harbor Hotel.